Miguel Ortiz Berrocal (1933-2006) was an award winning Spanish figurative and abstract sculptor, best known for his puzzle sculptures, which can be disassembled into many abstract pieces. These works are also known for the miniature artworks and jewelry incorporated into or concealed within them, and the fact that some of the sculptures can be reassembled or reconfigured into different arrangements. Berrocal's sculptures span a wide range of physical sizes from monumental outdoor public works, to intricate puzzle sculptures small enough to be worn as pendants, bracelets, or other body ornamentation. From 1967 to 2004, Berrocal worked in Verona, Italy and in nearby Negrar, where he worked closely with sculptural foundries to produce his art. His work was exhibited widely throughout Europe and also in North and South America and Japan. In 2004 he returned to his birthplace in Spain, remaining artistically active until his sudden death in 2006. As of 2014 the Fundación Escultor Berrocal (Berrocal Sculpture Foundation) continues to preserve and promote his artwork and legacy, from its headquarters in his hometown of Villanueva de Algaigas. 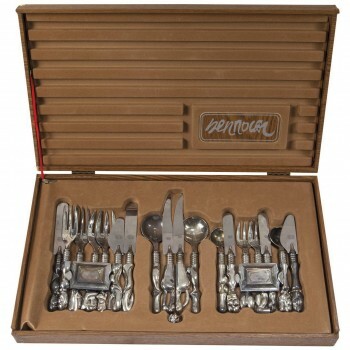 Miguel Ortiz Berrocal (1933-2006), table service with 18 rooms and a ring, silver metal. Content in a box with the name of the author, Circa 1980, Spain. Measures of the largest room: Knife: Height 21 cm, width 4 cm, depth 2 cm.